For many time I wanted to learn to use EPF bu technical reasons always stoped me. Blame me because I'm not an Eclipse guy and I'm not into its eclipse-isms but until today I have not been able to launch it. Now, wirth this really simple recipe you'll be able to run it. 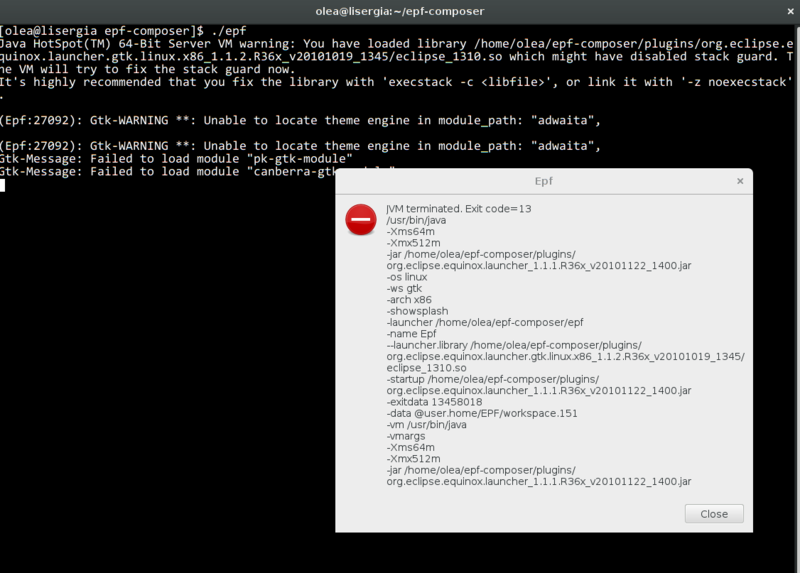 Java HotSpot(TM) 64-Bit Server VM warning: You have loaded library /home/olea/epf-composer/plugins/org.eclipse.equinox.launcher.gtk.linux.x86_1.1.2.R36x_v20101019_1345/eclipse_1310.so which might have disabled stack guard. The VM will try to fix the stack guard now. Please note the precise path may be different in your system but in any case it should point to a 32 bit java binary.